Do you have any "back-to-schoolers" in your house? I've got an easy DIY back to school wreath for you to make! I've got 2 kids that are starting to prepare for the new school year. I try to make holidays & events as festive as possible. 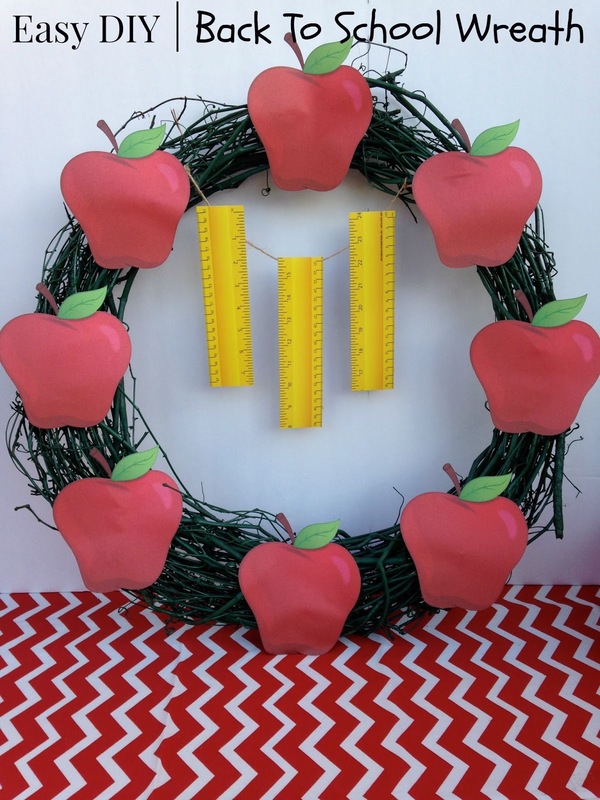 This back to school wreath will add a fun touch to any door. When there is a holiday, or special occasion, I like to hang a wreath on our front door to celebrate an event. They’re easy to make, and are usually pretty inexpensive. Before I start attaching all my pieces to the wreath, I like to place them lightly on top of my wreath, to figure out where I’d like to glue everything down. Once you figure that out, start hot gluing your items to the wreath. I evenly spaced my paper apples, and started the hot gluing process. I continued gluing my items, until I had finished attaching them all the way around my wreath. I attached twine to the top center of my wreath. This is where I'll add more school related embellishments. I took my paper rulers, and hot glued them to the twine. To make sure I spaced them evenly, I added the center ruler first. Then I repeated the steps until all my rulers were attached. I paid $2 for this entire project. I already had the wreath, paint, and twine. I went to Dollar Tree and found the paper apple package, and rulers, in their school related section.